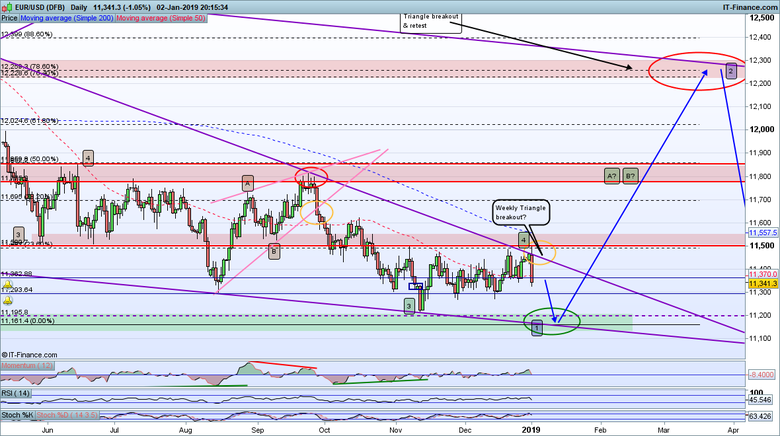 I have been waiting for a USD Bearish move, which I believe will be a retrace rather than motive move (i.e. a counter trend move) for some time but so far it hasn't arrived. 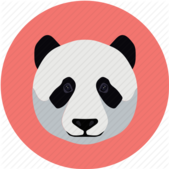 It goes to show that patience is a massive virtue when it comes to successful trading, that and careful money and risk management whilst seeking the right set up. I have re-looked at USD using the Dollar Index as a guide and come up with the following assessment. 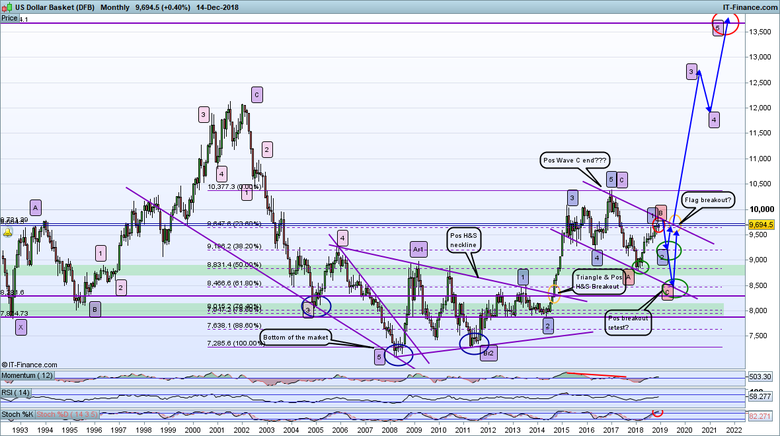 Long term (Monthly chart) the overall picture of a major USD rally remains unchanged at this juncture as nothing in the fundamentals or technicals has materially changed and a rally is consistent with my Bearish bias for stocks and the Euro (Fair warning on my bias!). The market bottom is the Head of a Head & Shoulders formation with the Neckline as the upper part of a coiling Triangle. The breakout of this Neckline/Triangle produced a very strong and fast rally. I think the long term chart now shows a potential consolidation Flag formation (very strong lower line in terms of unsuccessful retests of this line as a supporting trend-line), however the upper line is weak. If correct then we may expect the upper line or thereabouts to offer resistance that pushes the USD into a Bearish move. This Move could either return to the lower Flag line or bounce of nearer term resistance to set up a retest of the upper line. Looking at this on the Weekly chart you can see the latter retrace scenario in the form of a coiling Triangle 1-2 (pink), 1-2 (blue), which, if correct, may retest the channel breakout zone at the Fib 76/78% level before rallying away. However the Pink 2 could easily be a wave A that would result in the alternative scenario proving correct but I am not too worried about that at present as both scenarios as Bearish and price action should reveal which one is valid in due course. 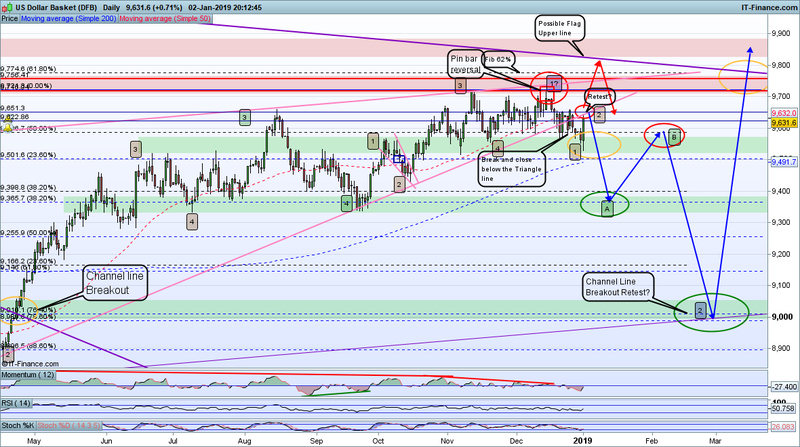 The Daily chart shows a possible road map for my lead scenario. A drop in a form that shows an A-B-C pattern that culminates and rallies from the Fib 76/78% would be a strong indicator that the big USD rally is on. 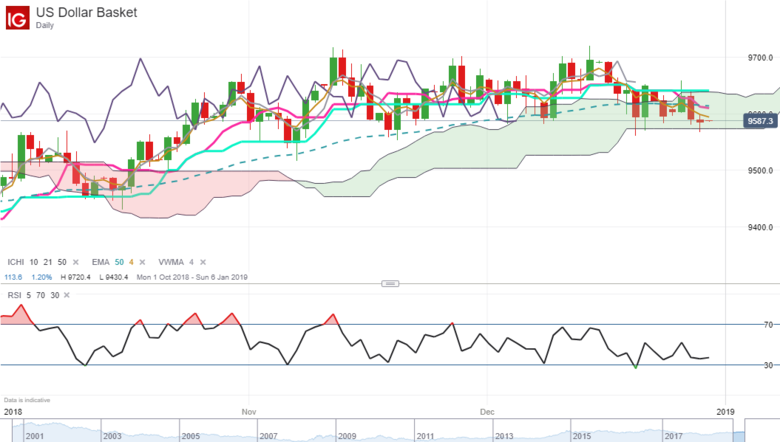 I will be looking for correlations from other markets for this potential USD rally plus Fundamentals support such as deteriorating global economic conditions. There is a real risk of a rally off the Fed release today, whether that brings up a fresh higher high or just a retrace remains to be seen. If we do get this then watch out for a precious metals drop in the opposite direction. SO there is that rally I was talking about, courtesy of the Fed. It looks to me like a retrace is more likely rather than a higher high but let's see how things shape up in the coming days. Looks like last nights Fed move was all the retrace we are going to get on this one at present @elle I see your stop run as a pin bar reversal on the Daily chart. Price poked up just above the previous high, which if a confirmed turn is a weak rally. Now I return to me longer term set up but I can't help feeling we have to watch out for another retrace before the USD Bearish move really gets going. 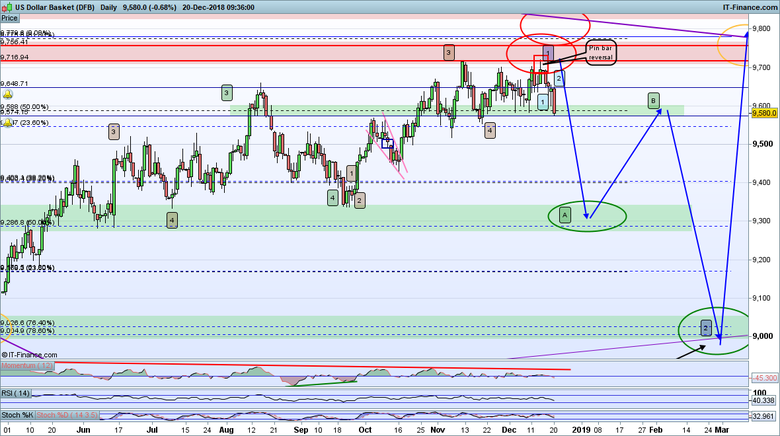 I am preferring AUDUSD at present as a more manageable market with respect to new led volatility. Although I should point out, for good form, that I only have a few small positions in FX just now as I am heavily focused on Stock indices Shorts and precious metals Longs. I still think USD is going to make a Bearish move before any major rally but I really cannot say whether the current rally is just a retrace of will show a higher high. I can make technical cases for both and I judge them to be 50/50 at present. 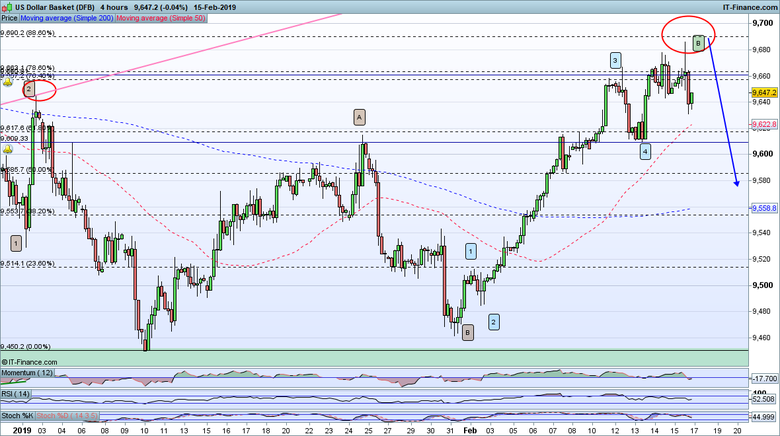 I can see something similar on EURUSD for instance, with a number of possible retrace points. 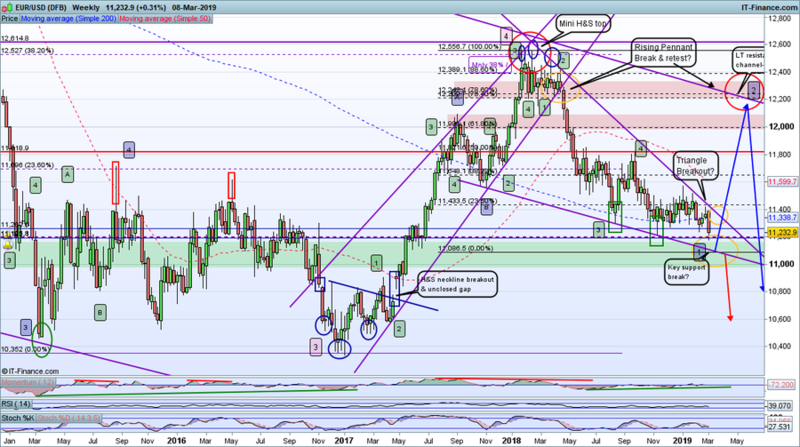 I would be USD Short biased if not for my assessment that precious metals is due a bearish phase short term, again before a longer term rally. I use the axiom, "when in doubt, stay out". So I am focused on Stocks Shorts and will wait and see on FX. If stocks continue to decline can USD fall? Can Precious metals? Maybe if we get that Flag consolidation on Stocks I mentioned elsewhere we might also get a softening of precious metals and USD but that would mean precious metals are detaching from USD as a driver and aligning to stocks. Hmm, lots to play out and assess over the coming weeks. We may get a retrace turn on the current rally (1 hour chart) into that Bearish move. At present don't really know so will stay out and await price action to reduce the scenarios or increase the probability of one of them. 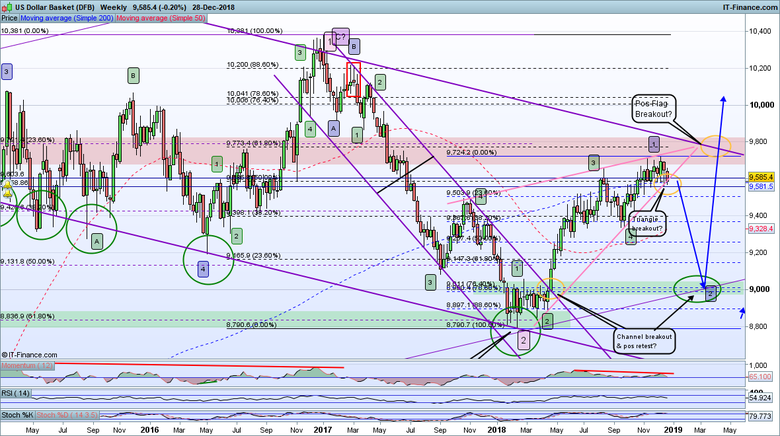 If anything I perhaps favour a short term period of USD strength that drives precious metals and EURUSD down to the next support levels before rallies get underway. 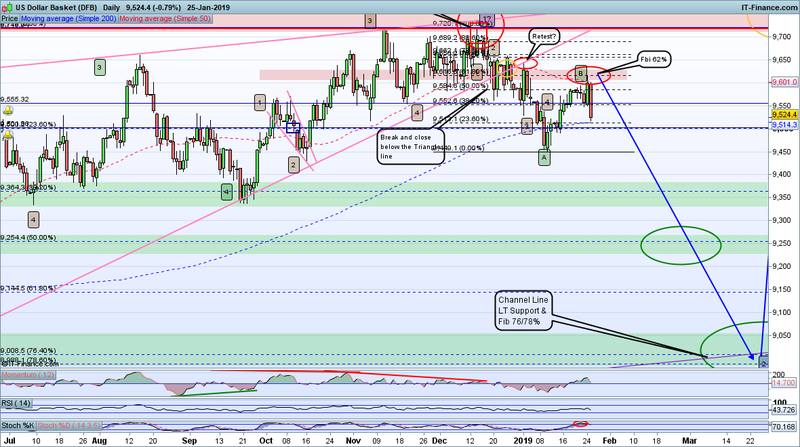 While waiting for things to evolve with the stocks retrace (or alternatively a break down through recent support to recommence the Bear) I am looking again as FX and wondering if that Bearish retrace on USD might finally be on the cards. The long term prognosis (monthly chart) remains pointing to a strong rally for me but it looks like we may see a fairly significant bearish retrace to prime the pump for this, possible all the way down to a retest of the neckline breakout zone, although I see that as less likely just now. More likely is a 1-2 retrace, which can been seen more clearly on the Weekly chart where a rising long term trend-line intersects with the Fib 76/78%. But first we need to see a clear turning point. Currently I see a completed 1-5 up to wave 1 (blue) followed by a turn down that bounced off a supporting Triangle line and is now testing this again. There is NMD at wave 1 (blue) and oversold oscillators. 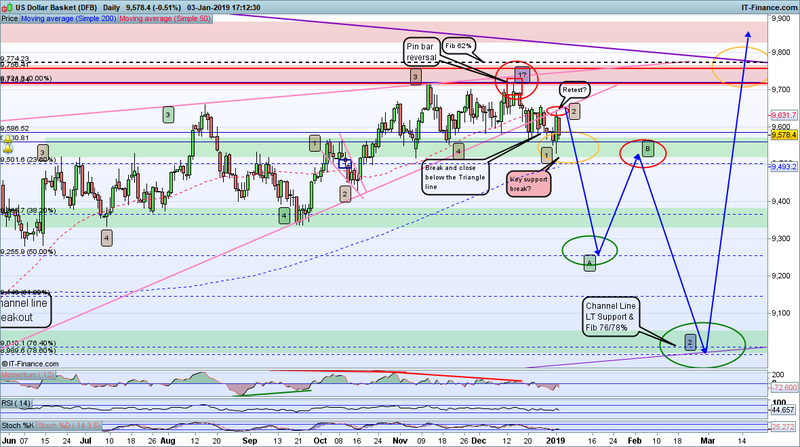 On the Daily Chart we can see that NMD much more clearly (and strongly) plus a 1-2 retrace prior to a break and close below the Triangle supporting line. On the 4 Hourly chart that 1-2 retrace is more clearly presented as a 1-5 down and an A-B-C back up, which is indicating that the trend has changed and is now Bearish. A break back down below recent lows support zone will confirm and then I will be looking for an initial A-B to set up a strong wave C to complete the Bearish move. 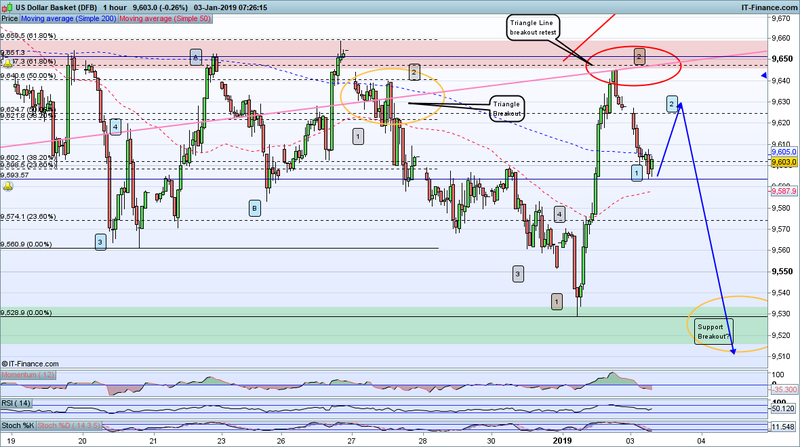 Short term though we should see a strong move down to at least the Fib 38% (9330-9400). Anyone see USD not moving into a bearish phase? @Mercury I have been watching your posts with a lot of interest, especially your TA. Can't go long or short right now. The way it looks on my daily chart TA is a short trade if price falls out of the cloud. Some other FX pairs seem to be lining up for shorting the USD if price falls out of the cloud on those. One recent pair that has happened to is USD/SGD. I think your cloud is roughly equivalent to my Triangle lower line and near term support so looks like we agree using different methods, which is excellent @Nelsy-Boy. I only use DX as an indicator and am already Long AUDUSD and GBPUSD, the latter took a nice rally this morning. EURUSD is also looking to breakout of a key level. 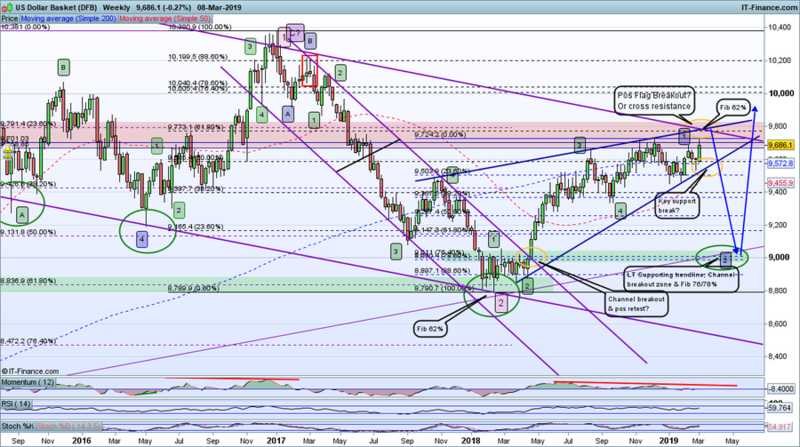 PS:looks like that NZDJPY is working out well according to the pure technical analysis picture with the Yen going through a period of strength vs USD, did you trade it? 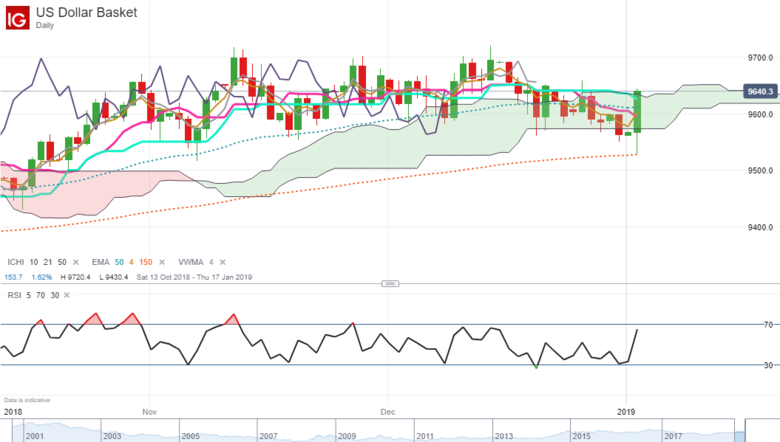 @Mercury I am short NZD/JPY and I shorted USD/SGD after my post last night. I also shorted AUD/GPB last night. Watching closely though because of volatility. Keeping things tight as I don't like losing money!! OK @Nelsy-Boy, I don't really trade the derivative crosses much, except for EURGBP, I prefer to stay with the primary USD crosses as I believe the USD is still the main FX market driver so don't have much to offer on those trades. 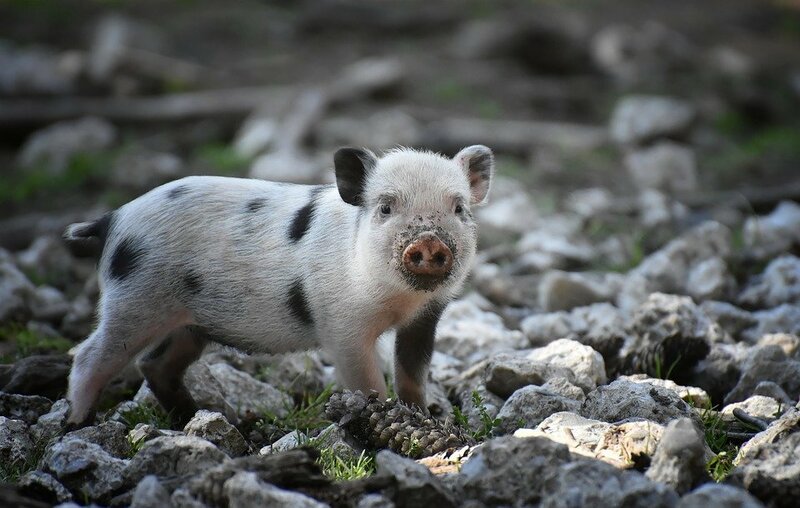 One thing though, FWIW, no one likes taking losses but it is a art of trading so while we don't have to be happy about it we do have to be philosophical and treat them as learning opportunities. Also depending on your attitude to stop exposure, taking a loss does not necessarily mean your overall trade idea is wrong, just too early perhaps OR it may mean you need to think about reversing your direction. All depends on your methodology of course. So net I don't worry about losses so long as I practice good money management and are seeing movements I can easily rationalise as falling within my road maps. Yes totally agree with the above. I hope you had a good Christmas and wishing you a very happy, healthy, prosperous New Year in 2019. WIse words @Mercury. Thank you. @Mercury I see the dollar bounced off the daily 150EMA which is one of @elle 's favourites. Are you any clearer on what the USD is doing? any retrace we are going to get on EURUSD we already have and price will hammer down from here, especially once it breaks through significant support levels. we will see a new lower low on EURUSD (higher high on DX) before another attempt to retrace. Regarding scenario 3, if it is likely then we should see a turn on DX around about the retest of the large scale Triangle line. However this is not a very strong line and I am less convinced when I look at the equivalent picture on EURUSD. Keeping a close watch on price action will be key if you want to try to catch it early but the safer bet is to wait for a breakout from the Triangle on EURUSD (and similar set ups elsewhere on other pairs). Interesting points @Mercury. Would you mind telling me what DX is? DX is the USD vs a basket of currencies shown on IG as US Dollar Basket, AKA Dollar Index (DX). So far the Triangle resistance line has held USD, despite all the flash moves last night. EURUSD was more stable as usual. I might expect a small 1-2 retrace on the hourly followed by a larger drop to confirm this resistance rejection that would set up a period of USD bearishness. 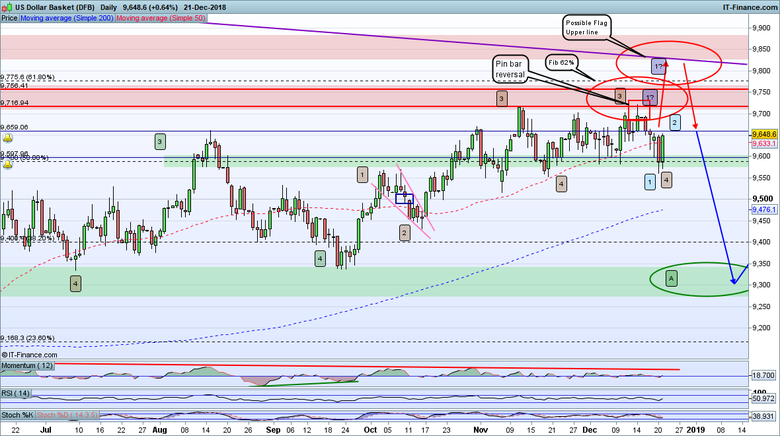 After a textbook failed retest of my Triangle line the market then put in a near perfect small 1-2 retrace to the Fib 62%, followed by a sharp drop, as projected by the technical analysis set up. We have seen these crazy robo trading spikes before and almost always they seem to occur at trend changes on FX. So far this is shaping up to be no exception. EURUSD and GBPUSD have put in small 1-2s, which I trade Long, and now we have higher highs on the move up off the spike low. Trading in the opposite direction from a flash crash is psychologically difficult, you need a good reason and strong technical set up with good stop positioning. We always worry more about an event after it has happened (human nature) but how many times has one flash crash been followed by another in close proximity? I can't remember one. 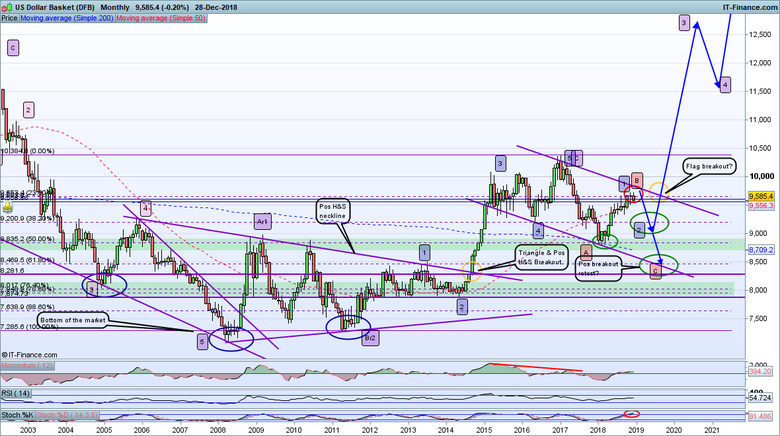 So leaning out on this I have gone Long to see if that counter trend rally will finally emerge. time will tell but thus far it is looking promising. Caution and good stop management is, as always but especially so with counter trend trading, vital. The Daily chart shows where I think this move could go, I remain long term Bullish USD so I am swing trading this and looking to get Short major USD pairs in due course for what I project may be a decent long term Bearish play. This ought to coincide with a resumption of the Stocks Bear (there or thereabouts). Just to complete the FX picture with respect to other posts, here is my take on DX. Nice hit and turn on the Fib 62%, after a 1-5 wave A down, so looks like a wave B completion (unless it is a 1-2 of a much bigger drop but time will tell). If DX does run consistently down from here then EURUSD will do the reverse. Either way I am looking at a significant bearish retrace move to set up a long term rally in due course. 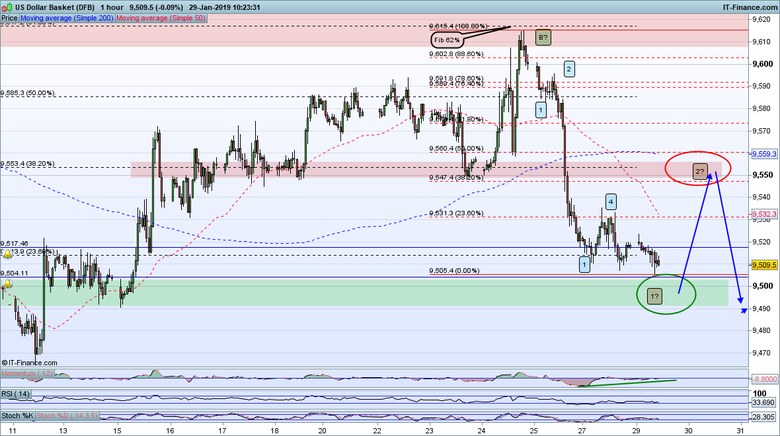 I am expecting a short term retrace on EURUSD and DX is showing signals of the same in reverse at present. 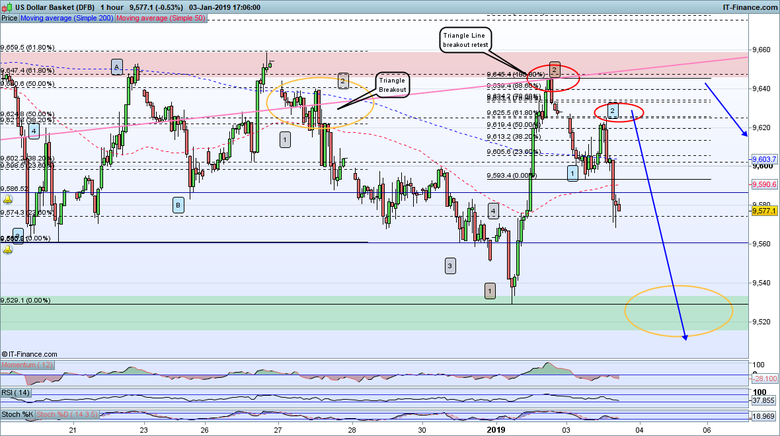 I think there is a bit more in the current move before any retrace. The point here for me is not to spot the turn and trade it but to be prepared for it and pyramid the EURUSD Longs when the retrace ends. 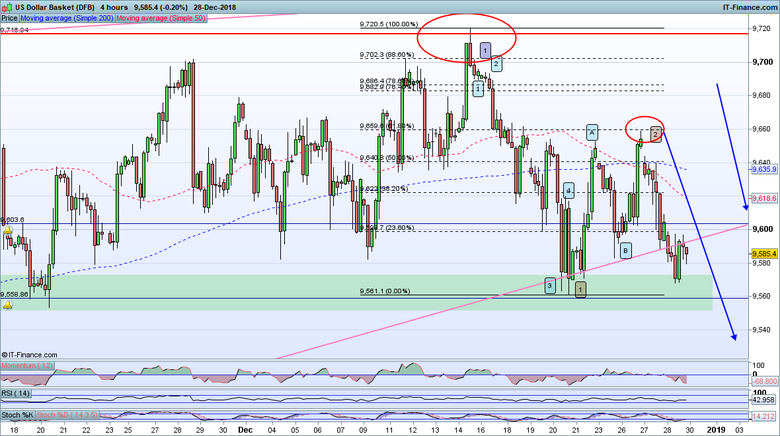 Stop protect at BE or cash any Longs within the Fib 50% zone. Seek to identify the retrace end and turn to add to early Longs. Regarding GBPUSD it is similar, although we may only see consolidation price action here. 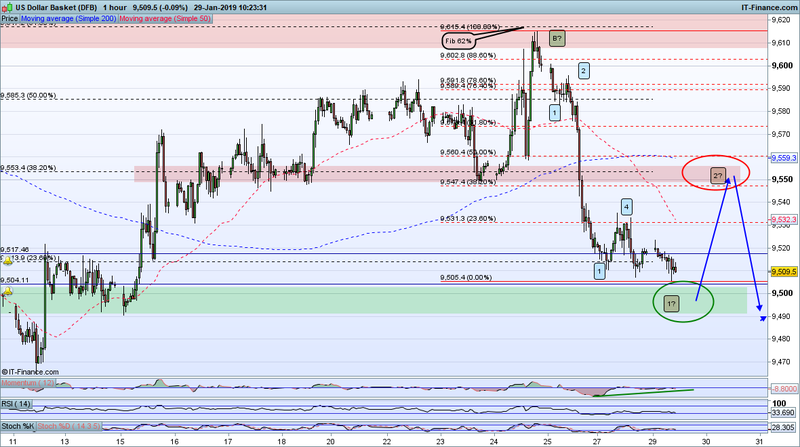 If so I expect a further bearish move on EURGBP. Another 2-3 weeks have gone by and clearly my wave B (green) from the previous post was incorrect but that doesn't mean my wave A was. This is a time of significant retrace action and long consolidations across many markets, things are taking a long time to resolve; as is often the case, patience and tight stops are the order of the day. For FX the USD looks like it could have finally hit a temporary ceiling with a sharp rejection at the Fib 82% (a very late and long retrace if correct). I have NMD on the 4 hours with other oscillators over bought. 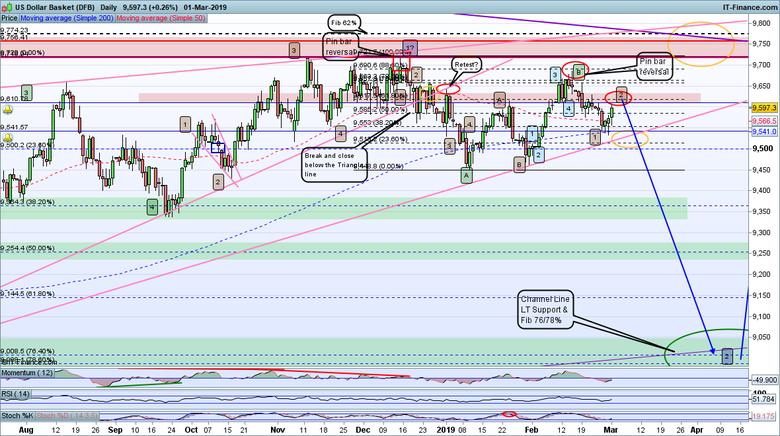 EWT count works well for a wave B in A-B-C format. If this pans out then the next move (a Wave C down) will run hard and fast. In line with this EURUSD looks to have turned on Friday and GBPUSD turned a while ago but has now completed a retrace (see other threads for details). If this all pans out then we can expect a resolution to the current consolidation. 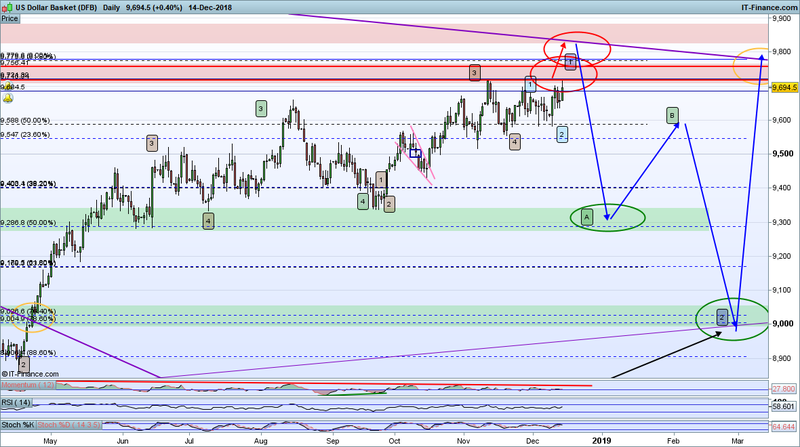 If not then another leg down but for me the odds (and in fairness my long term bias) points to the former scenario, although I would not be surprised to see a small bullish retrace on DX before things really get going Short. 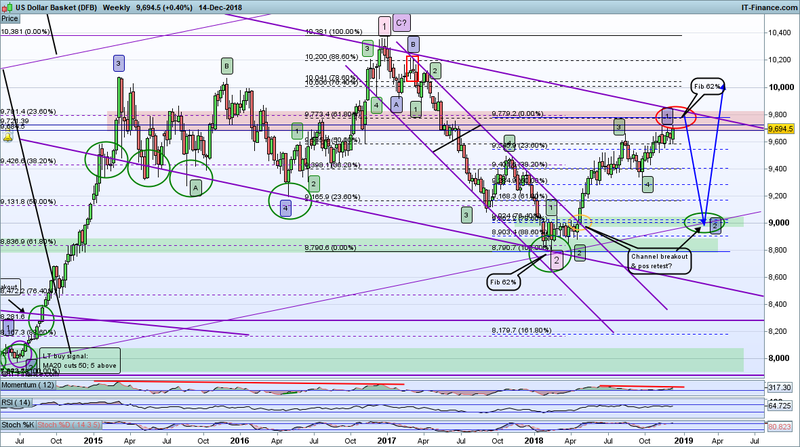 The overall USD picture looks like a retrace rally to me. I will be watching for a turn down on this market to coincide with key USD pairs. Although not surprisingly there is an unbroken Triangle formation as with EURUSD to contend with and an overhead long term resistance trend-line, which could result in a higher high before a retrace. The USD is still in consolidation, as is EURUSD unsurprisingly. These things take longer than one expect usually. So the question remains, will it break up into a long term rally or down into a significant retrace before hitting out on that long term rally. Note I do not entertain the scenario where the USD goes into free-fall from here. Main reason is that I am pessimistic about the long term outlook for the global economy. We have had it too good for too long and all the signs of a major recession (or worse) are there for me (including paid for economists saying it wont happen... yet!). Stock markets and economies (at least on paper!) have been fueled by central bank policy, which I believe will be studied intensively in the future and declared a disaster. Recently central banks have made a halfhearted attempt to pull back from their policy excesses, because they likely know in their respective guts that the economy has not responded and to continue is futile, they cannot get the inflation they are seeking to erode the debt excesses. The Eurozone economies as a whole are a basket case. China is flagging, unsurprisingly as they have been overheated for too long and (in all likelihood) being incorrectly represented in official data (although of course no one could prove that so let's say I take the prudent approach of discounting the official data). Emerging economies are struggling with USD denominated debt burden. Even the US economy is not as rosy as it seems, but likely still more stable than most. Trump policy seems to be to pull in to a US defensive posture to further stabalise it. Brexit is not helping the EU cause but is not the driver of their parlous state, the Eurocrats are terrified that the UK might be more successful outside that in, which they may well be, if for no other reason that they will not get plled down in the Eurozone meltdown that is, I believe, inevitable. The Eurozone economic model is not stable and therefore not sustainable and neither is the currency. In terms of policy, the central bankers must know that the end is nigh but who wants to be seen as the one who triggered the fall..? The alternative to carrying on is to admit error and reverse, which would trigger the very thing they have been trying to fend off, a depressionary recession. But to carry on with the same strategy that has not worked bears all the hallmarks of the theory of insanity often attributed (erroneously perhaps) to Einstein - "doing the same thing over and over again and expecting a different result". And they are not alone in this. How many times have we read the great and the good say "that this time it is different" or talk about the "new normal". LOL! Now the ECB seemingly wants to open the pumps again... Oh Oh! So much for the fundamentals, which can only supply the backdrop for me. I need triggers to trader so I use a technical analytical method to frame the fundamentals into real-time price action. 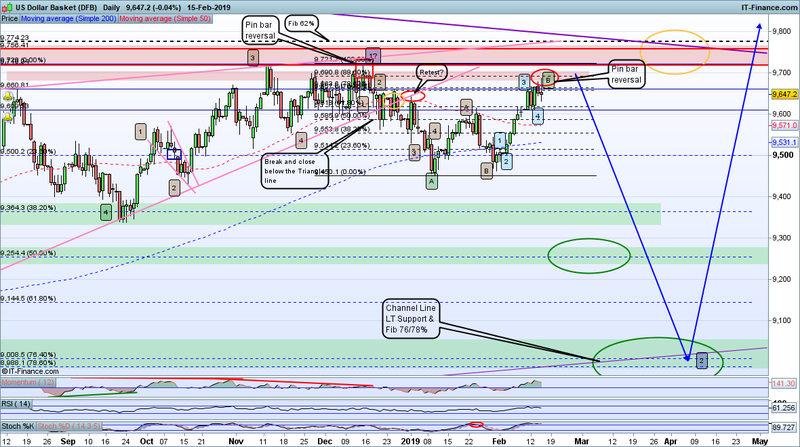 The DX move up since early 2018 has described a Triangle formation with significant resistance overhead now including the Fib 62% and a cross resistance point (2 or more trend lines intersecting). 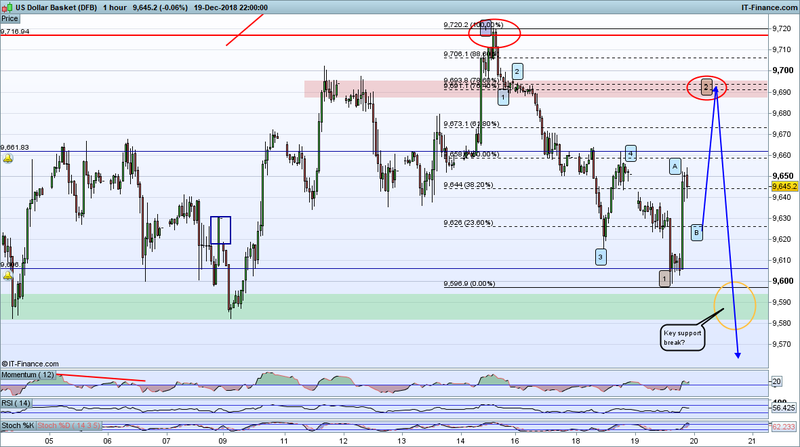 That this occurs at the Fib 62% level may be indicative of a major inflection point. There is significant negative momentum divergence (NMD) in play just waiting for a final trigger to push price into a Bearish move. 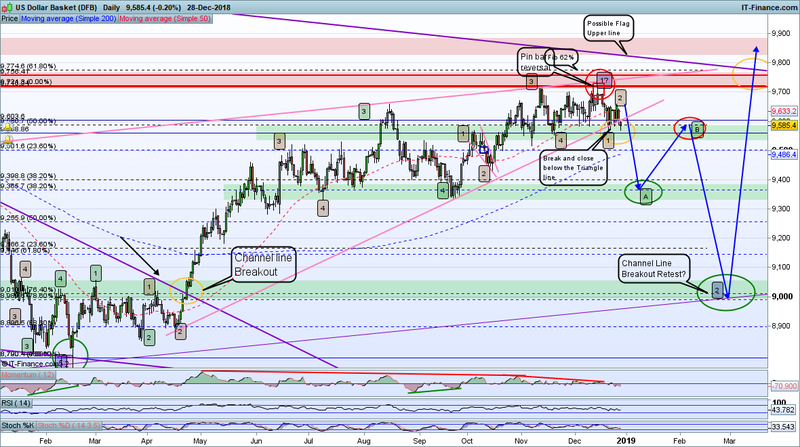 The EWT count has yet to see a significant 1-2 retrace. Previously I had thought the Nov 18 top might be the wave 1 top but another leg up is now on and that critical inflection point now comes into sharp relief. Looking at the Daily we also see a more recent Daily NMD plus other oscillators firmly over bought. On the current rally the desired 1-5 form has not yet completed, so a bit further to go perhaps to test that resistance zone. On the EURUSD chart you can see the same Triangle in reverse and in this case of course PMD. 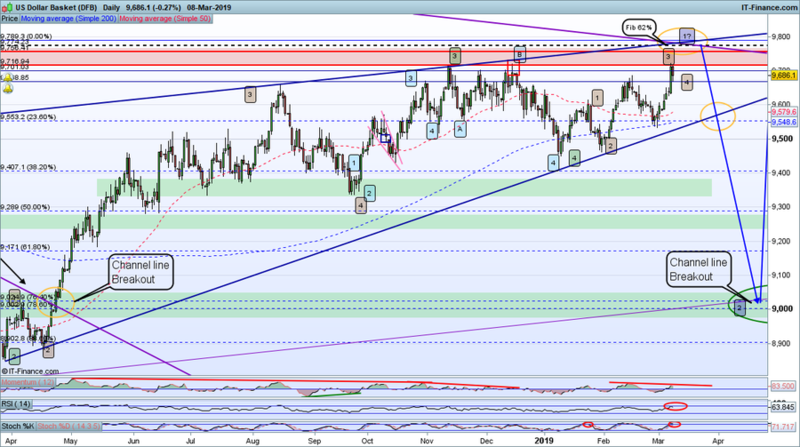 Net I expect another leg up on DX (down on EURUSD) before that significant EWT1-2 retrace, the termination of which will signal the final turn to complete the overall bearish move on play since the Credit Crunch. When this triggers (i.e. a massive USD rally) it will likely coincide with that stocks crash I have been banging on about for a few years now plus the precious metals rally I am seeing signals of all over the place. So that's what I think, does anyone have a materially different view? I would love to hear it.